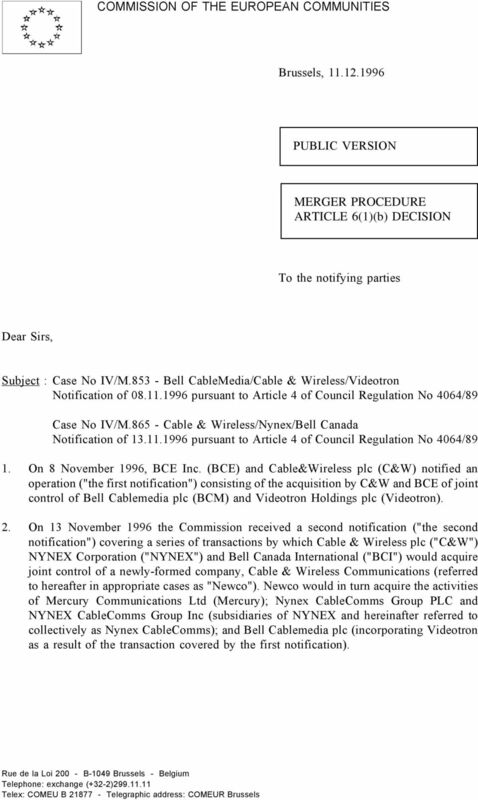 Download "Case No IV/M.853 - Bell Cable Media / Cable & Wireless / Videotron. REGULATION (EEC) No 4064/89 MERGER PROCEDURE"
6 - 5 - different relationship with the programme supplier than is the case in advertising-financed television. A distinction also has to be drawn between broadcasting as a service market and the provision of signals to subscribers. The parties do have some very limited broadcasting activities but these are de minimis and not relevant for the purposes of analysis of the competition issues arising. The relevant service market is therefore that for pay television. Cable networks 27. On cable networks, it has been argued that a service market exists consisting of both the networks and the services offered on them. Equally it may also be considered appropriate to identify two separate markets, given that competition will occur at different time and in different circumstances. For example, a market exists where would-be investors enter into competition to acquire franchises, to construct networks and consolidate their position as cable operators, whereas the business of delivering services on that capacity, or of allowing others to do so, can be regarded separately. However, in this case there are no affected markets within the meaning of the Regulation, whatever way the markets are defined, and it has not been necessary to arrive at an exact definition for the purpose of assessment. The question has therefore been left open. Fixed telecommunications networks 28. It has been argued that the capacity of optical fibre networks to carry voice telephony, and the unlikelihood that new entrants will confine themselves solely to offering television, may mean that market definitions based solely on fixed networks dedicated to voice telephony will no longer be appropriate in the future. In the meantime, it remains the case that telephony meets a type of need for the consumer which is not equivalent to the need for other types of services offered on fixed networks. 29. However, since in the present case the concentration would not raise competition problems, even on the narrowest market definition, the question can be left open. Fixed telecommunications services 30. The parties argue that voice telephony services should be assessed as a single market for the purpose of assessing this concentration. This was not challenged in the responses from competitors. The question can be left open, as there is no competition problem arising. RELEVANT GEOGRAPHICAL MARKETS General 31. According to the parties, the markets for activities such as pay television networks or services are national ones, owing to linguistic or cultural preferences and the regulatory regime under which the activities are carried out. 7 - 6 - Pay Television 32. In past cases (2), the Commission has decided that pay-television should be defined as a national market, owing to the existence of factors such as different language and cultural barriers, regulatory systems etc. The same considerations apply equally in this case. Cable networks 33. The parties contend that the operation of cable TV networks in the UK does not form a relevant service market, and that there are no affected markets within the meaning of the Merger Regulation. They point out that the UK regime is based on local franchises in which not more than one licence is granted. Thus customers in a given franchise area could not obtain cable TV from anyone other than the franchise holder, and the cable operator is not able to build networks outside his area. 34. However, whether the market is defined as local, in which case there is no horizontal competition concern as there is only one franchisee in each given territory; or whether it is defined as national - which means assuming that programme suppliers operating in other franchised areas are supplying programmes to the areas in question - the question can be left open, because on either definition the present operation does not give rise to competition concerns. Fixed telecommunication networks and services 35. The parties argue that the fixed telecommunications in which they are involved can be divided into networks (lines) and services (calls), and that the relevant markets are national markets in each case. The definition can be left open as these are not affected markets under the Merger Regulation. VI. COMPETITIVE ASSESSMENT OF THE CONCENTRATION 36. Whether the transactions are carried out to the point envisaged by the second notification, or brought to a halt at the point envisaged in the first, the conclusion on compatibility with the common market is the same, as set out below. Pay Television 37. If pay television is considered as a national market, then taking satellite and cable together, the share of the parties concerned in the Bell Cablemedia/Videotron acquisition represents about 5% of the total market, based on the proportion of UK homes with pay TV to which the parties have access. If Cable & Wireless Communications is successfully created, the share of the parties concerned would still represent under 10% of the total market. In either case, BSkyB would continue to account for well over 50% of pay TV subscribers within the UK, and will remain dominant. This is therefore not an affected market within the meaning of the Merger Regulation and no competition concerns therefore arise. (2) IV/M.469 of 9 November, MSG Media Service. 8 - 7 - Cable networks 38. In the UK, individual cable companies are granted franchises for their own area, and are responsible for delivering programme services within that area. The parties do not directly compete with one another in the delivery of services. They add that there is no opportunity for their networks to be leased to third parties, and hence no competition to speak of. 39. If, on the other hand, the cable network is taken as a national market, the parties to the Bell Cable/Videotron acquistion would together account for about [ ] (3) of the homes connected by cable networks in the United Kingdom. If the Cable & Wireless joint venture is successfully created, the market share of the parties, which would then include Nynex Cablecomms, would rise to some [ ] (4). As regards the position of competitors, TeleWest accounts for some [ ] (4) of the market share; other cable operators, such as General Cable and Comcast, have market shares of around [ ] (5), and smaller cable operators such as Telecential, CableTel UK share the remainder. Therefore competition concerns do not arise in either case. Fixed telecommunications networks 40. The position in the UK is that BT has both a trunk network and local connections. Mercury has a network of trunk lines but no local networks with direct access to subscribers. The cable companies can offer local connections in their own areas. 41. The cable companies compete with BT at a local level to offer subscribers voice telephony services over their cable lines. This service is limited to the local area: calls to other areas have to be run through lines provided by alternative service providers, whether other local cable companies (where calls can be switched across boundaries), or by hiring services from one of the telecommunications operators. 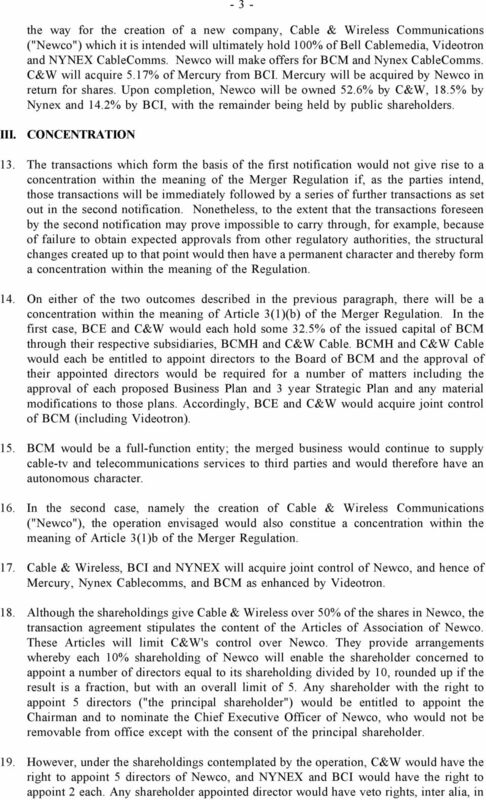 If the transactions include the acquisition of control over Mercury by Cable & Wireless Communications, then there is no competition between the cable companies and Mercury, as Mercury does not have local area networks, and the cable companies do not have trunk lines. 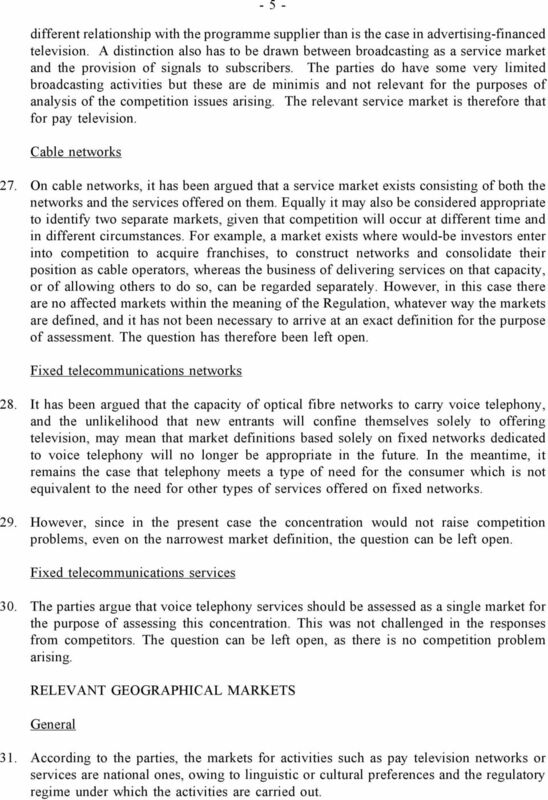 It can be argued that the parties involved cannot be regarded as realistic competitors in fixed telephone network operation in the UK, given the barriers to entry (for example the scale of investment needed). 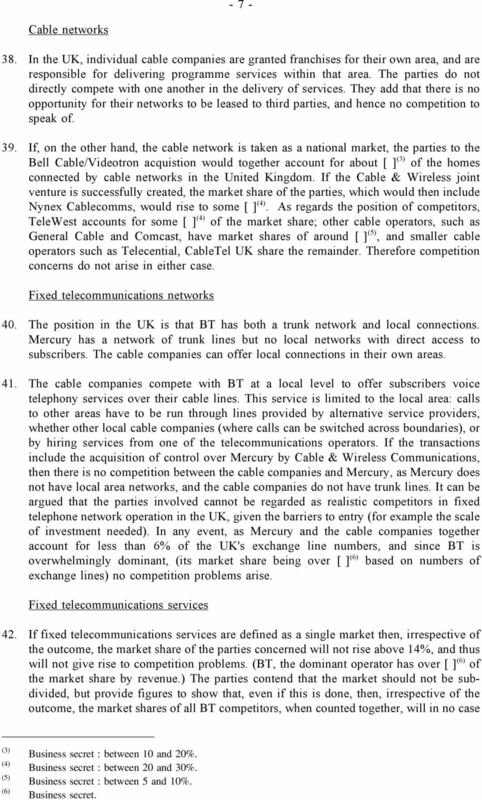 In any event, as Mercury and the cable companies together account for less than 6% of the UK's exchange line numbers, and since BT is overwhelmingly dominant, (its market share being over [ ] (6) based on numbers of exchange lines) no competition problems arise. Fixed telecommunications services 42. If fixed telecommunications services are defined as a single market then, irrespective of the outcome, the market share of the parties concerned will not rise above 14%, and thus will not give rise to competition problems. (BT, the dominant operator has over [ ] (6) of the market share by revenue.) The parties contend that the market should not be subdivided, but provide figures to show that, even if this is done, then, irrespective of the outcome, the market shares of all BT competitors, when counted together, will in no case (3) (4) (5) (6) Business secret : between 10 and 20%. Business secret : between 20 and 30%. Business secret : between 5 and 10%. Business secret. 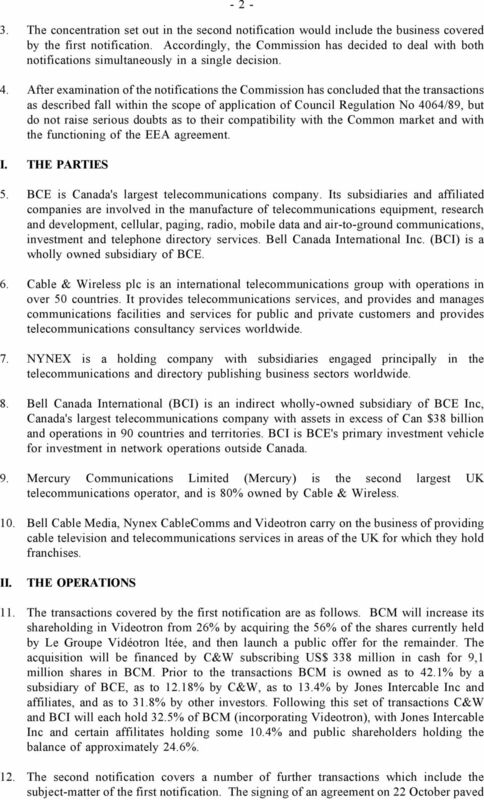 9 - 8 - exceed [ ] (7) of the total call revenue in the UK.. No competition concerns are therefore likely to arise. VII. ANCILLARY RESTRAINTS 43. The parties have submitted three restrictions which are considered ancillary to the concentration. 44. The first is an agreement restraining the sellers of the Videotron shareholding from carrying on business using the name for a period of two years from completion of the transaction. This provision would not have an effect on competition between the Member States. Likewise the sellers have accepted an obligation over the same two-year period not to carry on a business of a similar type to the business which is to be sold. These restrictions are necessary for the implementation of this concentration, in order to protect the goodwill transferred under the relevant share purchases. 45. The parties have also agreed to certain restrictions on the conduct of their businesses pending completion of the transaction, for example, to ensure that they will not enter into or agree to enter into any transaction which would require shareholder approval were they listed on the stock exchange. To the extent that these provisions can be viewed as restrictions, they can be regarded as ancillary, being necessary pre-completion restrictions to ensure that the values of the relevant businesses are maintained pending completion of the transaction. VIII. CONCLUSION 46. 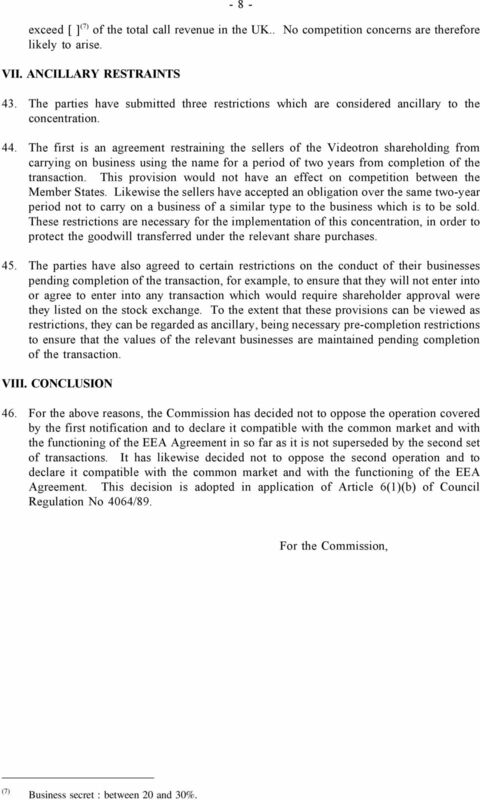 For the above reasons, the Commission has decided not to oppose the operation covered by the first notification and to declare it compatible with the common market and with the functioning of the EEA Agreement in so far as it is not superseded by the second set of transactions. It has likewise decided not to oppose the second operation and to declare it compatible with the common market and with the functioning of the EEA Agreement. This decision is adopted in application of Article 6(1)(b) of Council Regulation No 4064/89. For the Commission, (7) Business secret : between 20 and 30%. Case No COMP/M.6215 Sun Capital / Polestar UK Print Limited. 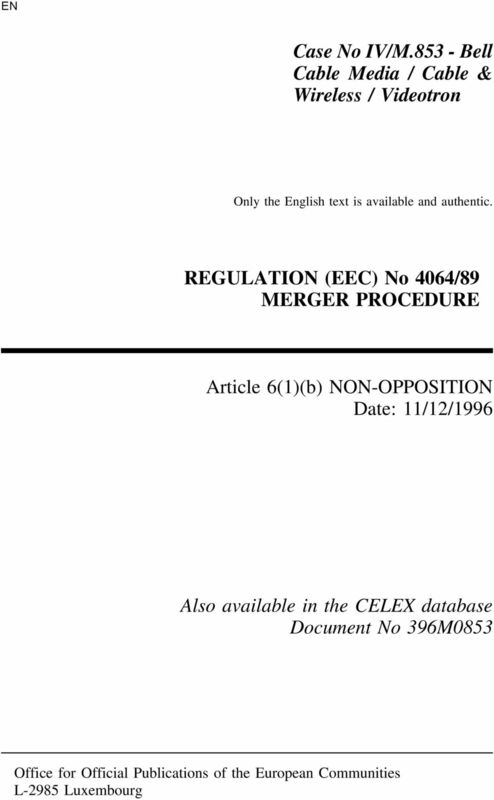 REGULATION (EC) No 139/2004 MERGER PROCEDURE. Article 7(3) Date: 15.4. AMENDED AND RESTATED ARTICLES OF INCORPORATION OF BEST BUY CO., INC. ARTICLE I NAME. The name of this corporation shall be Best Buy Co., Inc. SUBSCRIPTION AGREEMENT RELATING TO STIRLING FORT ASIA PTE. LTD.